Sculpture in Stone (MFA), no. 283. The akroteria are damaged; the surface is slightly incrusted and yellowed; but what remains is in good condition. A large, complex rosette appears in the tympanum. In the field below are the remains of three inverted wreaths with fillets, carved in low relief in recessed circles. 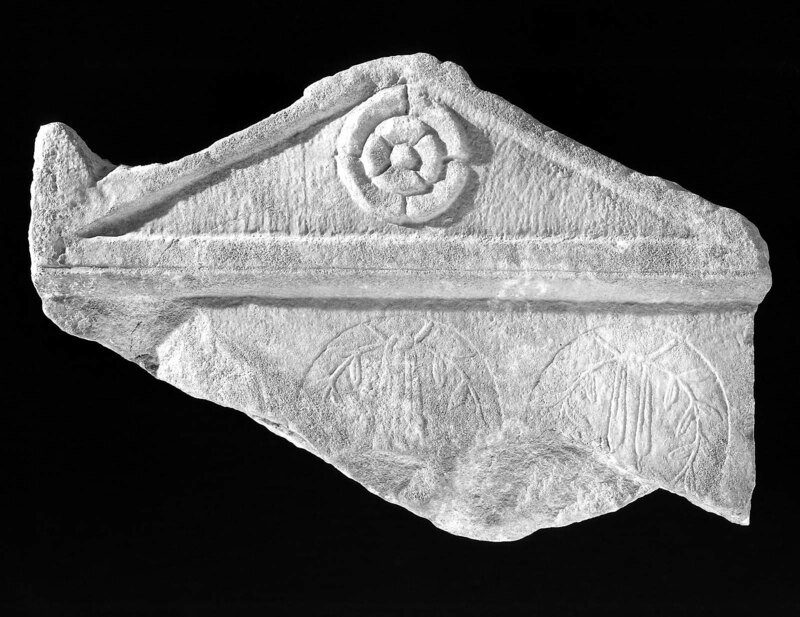 One might assume that this formed part of a dicast’s stele, but such monuments with multiple wreaths were set up to magistrates who had served on embassies to Rome and elsewhere, and especially to athletes. A splendid example in this last category was found in the atrium of the church of Saint John at Ayasoluk-Ephesos. From Assos (Behramkale, Turkey); presumably from the area of the Agora. 188? : excavated by the Archaeological Institute of America; gift of the Archaeological Institute of America to MFA, January 1884.